a trading system, there is no risk management and is akin to trading in the blind. It is therefore not surprising to find that trading systems or strategies are the most popular, regardless of what market you choose or your style of trading. There are trading systems built for intra-day markets and then there are strategies that help you to pick investment ideas. Most of the trading strategies that one comes across are typically based on candlestick or bar charts. This however does not mean that you cannot use the strategy on a Renko chart. Price is after all price and it doesn’t change when you switch from a Candlestick chart to a Renko chart or vice-versa. So you have a trading system and you have your charts. The question that comes to mind is if it works the same way for you, as it did with the original trader. If you stick to the trading rules and apply the trading strategy as instructed, chances are that you might be on your way to making profits. But we often get too greedy or too curious and end up testing the trading strategy across similar instruments within an asset class or take the bold way and apply the trading strategy to a completely different asset. The results can be 50 – 50. Meaning, it may or may not work. In this article you can read the three most important things to remember when applying a day trading strategy to Renko charts. It even applies when you are building your own trading system on Renko charts. The results may surprise you depending on how well you are familiar with Renko charts. Have you ever tried applying a long term trading strategy to a 5-minute chart or an intraday scalping strategy to a daily chart? Chances are that you will find that the trading strategy doesn’t give the same results. With Renko charts, while time-frame is not the issue, the box size of your Renko chart can play a big role. As an example, if you were to trade with a 10/20 Exponential moving average crossover trading strategy, would you expect to see the same results when applying this method to a 5 pip fixed Renko chart and a 20 pip fixed Renko chart? What many traders fail to realize is that the box size of your Renko chart plays an important role and this is something that is often missed but is in fact one of the crucial steps to success in your trading strategy. Using an incorrect box size can render the trading system that was hitherto profitable, practically useless. There is no easy solution to this unfortunately. 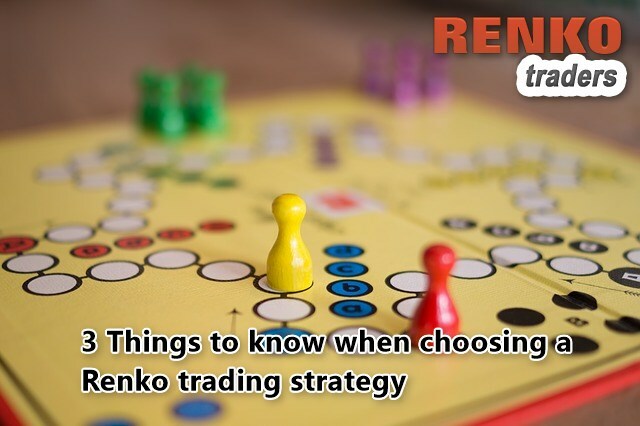 It is in your best interest to apply the trading strategy on different Renko box sizes for the same instrument and choose the one that gives the best results. This second tip is essential and comes with the same importance as the previous tip. Not all trading systems give the same results across all assets or instruments. For example, if you applied a promising trading strategy that is known to work on Indices trading and used the same on a Forex currency pair, you will get different results. The reason is because every asset or instrument is different and comes with its own unique characteristics such as the spreads, volatility and even the fundamentals. This same holds true when trading with Renko charts as well. A profitable trading strategy that works on one instrument should not be mistaken as a standard benchmark for all other trading instruments or assets. When you come across a trading system that seems to work well on one asset or instrument and if you want to expand this to other instruments then the first step is to look at similar assets. So you have a Renko trading system that works on DAX. Great! Now extend this trading strategy to the S&P500 or the FTSE. Does it work? If it doesn’t try tweaking the strategy settings, even play around with your entry and exits and position management until you start to see some similar or consistent results. Having a trading goal being defined first is essential. If your aim is to take a fixed pip in profit, then why bother applying a trend trading system where buy and hold is the norm? The same holds true when applying a trading system to a Renko chart as well. So the next time you come across a trading strategy that blows your mind away, take a step back and first understand the fundamentals of the trading strategy and then figure out if this is how you want to trade. It can be hard to resist temptation but going about it in an objective way can help you from losing money in trading. We conclude this article here. The three points mentioned in this article can go a long way in helping you to find and trade with the most appropriate profitable trading strategy for your Renko charts. While a trading system that you picked up from somewhere can work on a Renko chart, there are a few important factors that you must bear in mind especially when applying a day trading strategy to a Renko chart. Test in no deposit bonus forex account first to start this renko scalping strategy. About: Ranga is a blogger at renkotraders.com. He has been trading with Renko charts for over five years. Follow ranga and learn more about Renko trading. 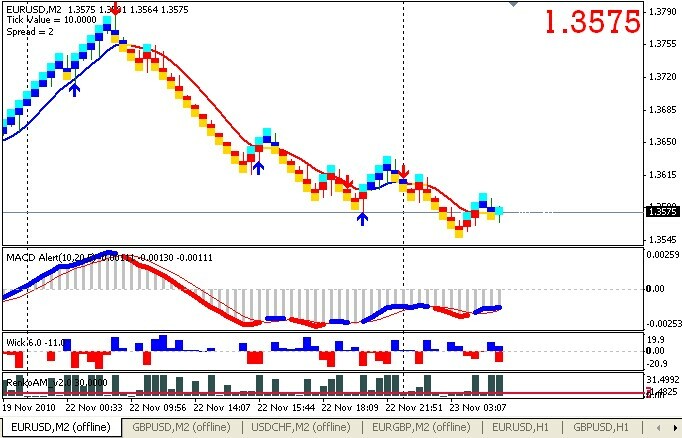 Wanna test scalping with rencko charts mt4 free download ? test it this forex renko charts ea combined with donchian indicators for free.